The soul has tinted the color of its thoughts. Think only of those things that are in line with your principles and can bear the light of day. 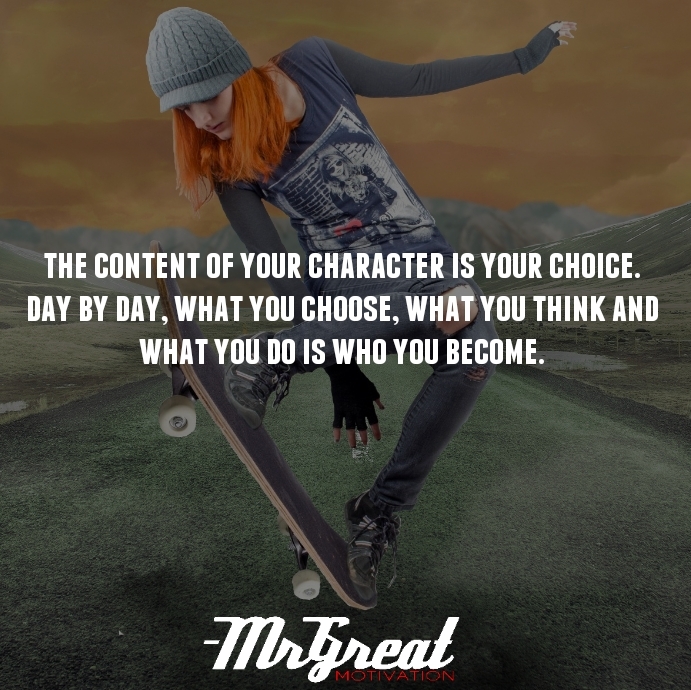 The content of your character is your choice. Day by day, what you choose, what you think, and what you do is who you become. Your integrity is your destiny. It is the light that guides your way. The mind is a very powerful thing, and most of us take it for granted. We believe we aren't in control of what we think because our thoughts seem to fly in and out all day long. But you are in control of your thoughts, and you become what you think about. You are not headed with a great, notable character; you acquire it by your thoughts and activities. Everyone has a choice concerning how they will live their life and what kind of person they want to become. You are what you do, not what you would like to do or what you fantasize about doing. 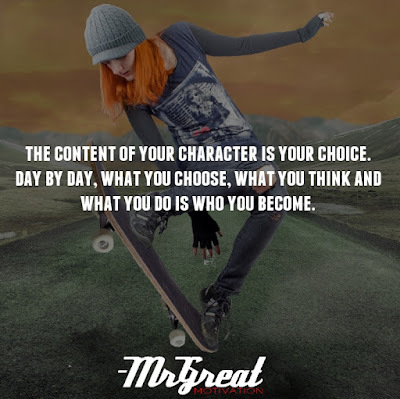 You make the choice about what kind of character you will develop, but you do have to act on that great choice. Just thinking about it is not enough, you have to take action. What postulates and motivations do we carry with us? What are our criteria? Who do we really want to be? It is time to stop waving with the wind. Determine who and what you will be, and then start taking action today to become exactly that person. Do it now. Stay Motivated.